Hot dip galvanizing is the process of coating iron or steel articles with zinc by immersing the metal in a batch containing molten zinc at a temperature of around 450°C. During the process, a mettalugically bonded coating is formed which protects the steel. The majority of galvanizing plants can accept a wide variety of shapes and weights of steel fabrication. A small number of specialist plants are semi-automated or fully automated for galvanizing long runs of sheet, wire or tubes and do not operate to BS EN ISO 1461. In the UK and Republic of Ireland, hot dip galvanizing plants operate as service providers who apply a galvanized coating to their customers` work. The various stages of the process are detailed below, although there may be variations between individual galvanizers. In the initial stages of the process fabrications or castings delivered to the galvanizer are subjected to initial examination and sorted to enable the galvanizer to arrange their work programme in the most efficient way. Where steel delivered for galvanizing shows residues of light grease or oil this may be removed in a degreaser or by using some alternative method of cleaning. A caustic or acidic degreaser is usually employed and after degreasing the steel fabrication, it may be washed in a rinse tank to avoid transfer of the degreaser to the next stage. Chemical cleaning removes rust and mill scale, which are the most common corrosion products contaminating the surface of the steel fabrication. The cleaning process is usually conducted using hydrochloric acid at ambient temperature and the objective is to produce a chemically clan steel surface prior to immersion in the molten zinc. The cleaning time depends on the degree of rust on the article. Work is washed in a rinse tank after cleaning to prevent carry-over of acid into the flux. Flux serves to remove any remaining traces of impurities and provides a final intensive cleaning of the steel surface. Flux increases the wetability of the surface of the steel to the liquid zinc so aiding the reaction between iron and zinc. The flux usually consists of an aqueous solution of chlorides, principally a mixture of zinc chloride and ammonium chloride. Flux is applied to the materials to be galvanized in different ways. For example, in most galvanizing operations, flux is contained in aqueous solution in a tank and the work to be galvanized is dipped into it. Alternatively, the article to be galvanized may be immersed in the zinc by passing it through a flux blanket which floats on the surface of the zinc. This latter process is known as wet galvanizing. After immersion in the flux tank, steel articles for galvanizing are dried and become coated with a thin film of flux. Many plants allow work to air dry while in some hot dip galvanizing plants waste gas from the burners heating the galvanizing bath are used for heating a drying oven. The galvanizing operation takes place in a bath containing molten zinc, the temperature of which is controlled in most plants in the range 440-460°C (zinc has a melting point of 419°C). In galvanizing plants which operate the high temperature process, the zinc temperature will be about 550°C. The analysis of metal in the bath must comply with relevant national and international standards and comprise at least 98% zinc. The galvanizing process causes the formation of a coating consisting of layers of zinc-iron alloy formed by the reaction of zinc with iron in the steel. As the galvanized components are withdrawn from the molten zinc a further layer of near pure zinc is formed over the alloy layers. The immersion time for the steel articles depends on its weight and the thickness of the steel sections. 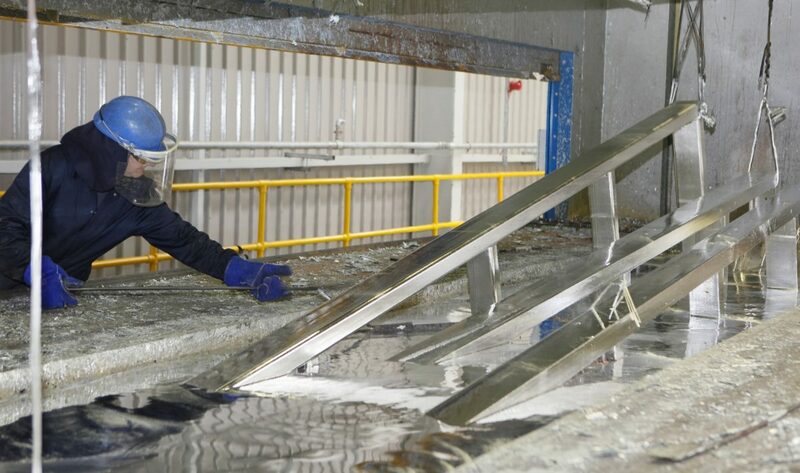 While the galvanizing process is taking place, the surface of the molten zinc is swept back to ensure that the galvanized article does not become contaminated with ash and flux residues on withdrawal from the galvanizing bath. The galvanized steel is either lest to air cool or is immersed in a quench tank. The final stages of the process are checking for quality and weighing. Galvanizing which complies with BS EN ISO 1461 must consist of a continuous, relatively smooth coating that is free from flux staining and must comply to the relevant coating thickness criteria. Also any galvanized material is weighed, as the galvanized weight is normally used as the basis for pricing. The thickness of the zinc coating is a fundamental criterion of the quality of a hot dip galvanized coating. It is normally measured in microns (1 micron = 0.001mm) although the coating thickness may occasionally be expressed in terms of coating weight measured in g/m2. If a customer has special requirements regarding appearance or coating thickness it is necessary for the customer and galvanizer to agree on these before the order is accepted. To ensure a quality end product, it is good practice to create a communication chain between the specifier, fabricator and galvanizer so that questions can be addressed at the design stage. Consideration must be given to the maximum bath dimensions at the chosen galvanizing plant, along with maximum weights for the lifting gear used for transportation and handling during the galvanizing process. Steel quality, chemistry and surface finish all play a part in the galvanized coating but the fabricator should be aware of the importance of removing contaminants such as paints, welding slag and heavy greases before sending articles for galvanizing.